Welcome to the Volvo Coupé Bertone Homepage! No State car from the enemy. 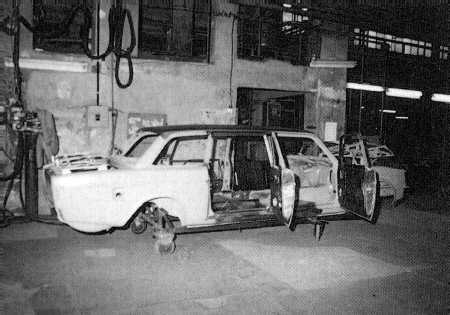 Everyone knows that the Göthenburg limousine was the preferred choice of the former East German Security Service 'Stasi'. 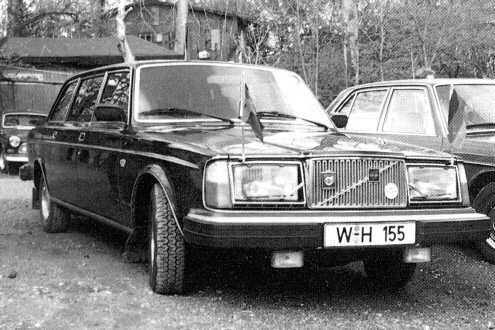 What the East German bosses did with these likeable Swedish limousines we are about to tell you. Our current thoughts are that Volvo took advantage of the leaders. But then that is understandable for before the wall fell. The 264 Landaulet with all the extras and two standards (hammer and sickle). In good weather this was the perfect state car to pay tribute to the flag waving public. Waving, waving, smiling, smiling... "we love you" . East Germany in the Seventies. It was impossible as socialist to let it be known publicly that a car from Sindelfingen or Munich was preferred (which was of course privately the case). 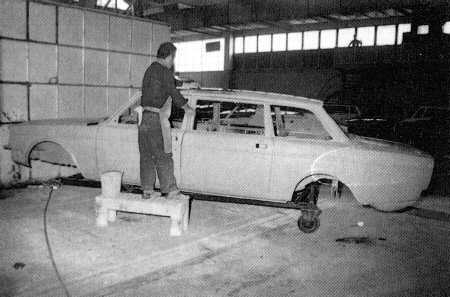 Cars from the USSR, "Tschaika" or "SIL", also didn't meet the taste of the top men in East Berlin nor did Casto's Cubo. Some were probably too thirsty, or, by construction and design, far too old-fashioned, and certainly uneconomical. They wanted to appear open and modern, at least to the outside world. But their own automobile industry didn't produce anything modern, and when they did have new ideas they immediately sold them to the west. So, as always, the only alternative was to import the goods. 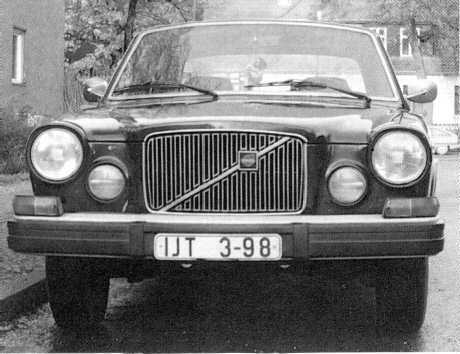 Volvo - that was just what the top men were looking for - not too ornamental, technically proven, local, from a neutral country, but still a social state (but not many people knew that), from Sweden. Perhaps here socialism and socialist ideals were exchanged. They sound very similar but are very different in reality. Socialism is all about mutual respect and human rights, which were of little relevance in the former Eastern Germany. We know this now for a fact, although it was suspected for a long time. After the publishing of the Stasi files, it became clear to the citizens that what was happening in the German Democratic Republic was deteriorating. Our trusty Volvos in the hands of corrupt politicians. On the one hand a leading example of capitalism with no dark side, but one which without the western black market wouldn't have survived, on the other hand a system of conforming - which offered some advantage for the citizens, for example, rent and petrol prices that other countries could only dream of. A typical dark blue 164 just as it would have served the ‘deserving' people of the former East Germany, that was available for professors, officials and leading scientists, for example. Since 1968 the SIL was hand-made as a separate model in the Lichatschow factory in Moscow which was mainly used to produce lorries. 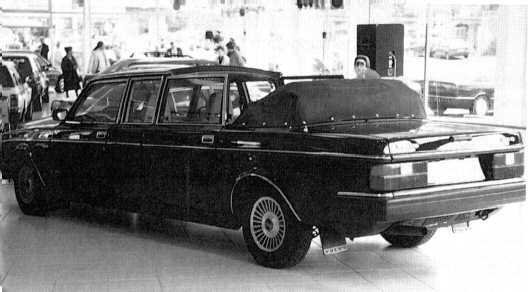 The State and Parade 114 type of ex-Russians shown remained just as the extended Volvo restricted to top officials of former East Block states and parties, in principle because they were too expensive. The SIL had 8 cylinders, a 7 litre engine and 300 SAE-HP. The turning circle of this unmanageable tank was 16 metres and it weighed 3000 kilogrammes and drank about 40 litres of super petrol per 100 kilometre. Cheers!! This ex-East German car IDA 8-10 changed in vehicle W-H 155. Of course, we can't criticise everything concerning socialism for that is not our job. It also had advantages to offer over our Western one-sided capitalistic system. Our freedom is not always a complete freedom and by comparison East Germany is not all dungeons. Even if freedom of movement was possible, within the given limitations, people would still have been on the streets in 1989. Then Erich Honecker would still have been the first man in East Berlin. Then he'd still be driving a Volvo today. That's today, the voting man. There would have been enough people in the former East Germany who would have happily changed their Trabant or Wartburg for a western car. The savings were there but the normal citizens would not be allowed to buy such a car. The paupers reached breaking point wherein the car played a big role. If the state council had been more tolerant then the revolution would have been less devastating. The authorities behaved stupidly underestimating the importance of the small privileges of the citizens. After 40 years of suppression they didn't expect that the citizens would go on strike. In 1989 it happened. In the name of peristroika Gorbechov congratulated Erich Honecker on his 40th National Day and advised him to stop and get wise (i.e. get out). Not a nice recommendation, but Gorbechov probably saw no other way out, other than trying to find a union between the west and the almost static East Germany. Hence it was a relief when the people rejected East Berlin. A second Prague Spring was not worth considering while Mielke and his followers were around. Yes it was quite acceptable to let the Germans shoot each other. But it seems that probably nobody wanted to play this game. In any case, Gorbechov didn't drive a Volvo. A 264TE photographed when the wall fell down by a firm in Köln. The Volvo behind had already the new K-PS 888 plate. 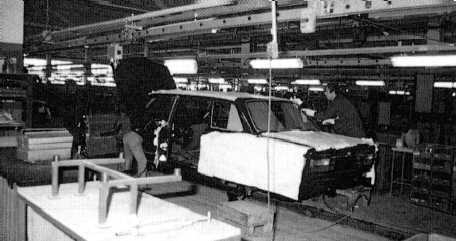 After the Berlin wall came down everybody from Maagdeburg, Cottbus or Halberstad was able to experience for himself and form his own opinion over Volvos. This make was not longer a taboo. 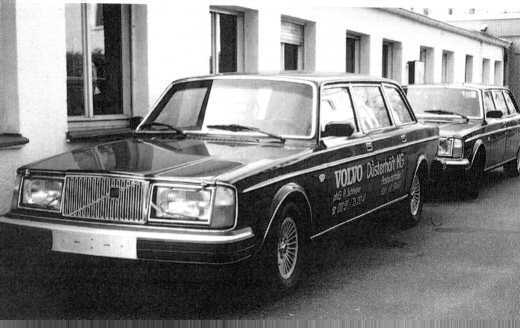 It wasn't so many years ago that only big bosses drove Volvos Nowadays that association is no longer valid. The vindication of Volvos in the New Germany had begun. Of course the rumours surrounding Volvos didn't completely disappear, but that was something that Swedes couldn't do a thing about. They were victims of their choices. For many years in the former East Germany they were the symbol of corruption and an inconsequent way of life of a minority. They frightened a few brave citizens, in their dark blue or black Volvos Odyssey of Volvo-carouses. This picture has been taken in Köln this beautiful ex-East German Landaulet-car has seen beter times. 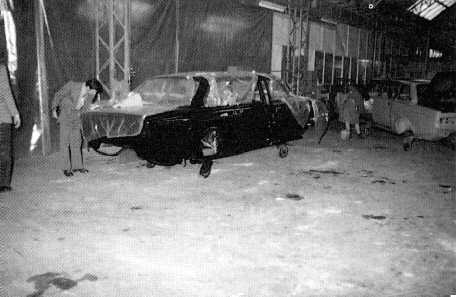 Where is this car nowadays? Nowadays it is nothing special. Most readers have a 850 or a Volvo from the 400 series or even newer. The classics such as Amazons or P1800s are exotic. In the beginning they had to be imported. The opinions haven't completely changed: A Volvo driver is generally suspicious. With time people forget. Nowadays the people who drive Volvos are convinced of their make. The bosses who believed in their constitutional state (and there are still a few) don't drive Volvo anymore. They have switched to Mercedes, Audi and BMW (how inconspiciously!). Only the real enthusiasts drive Volvo nowadays - people who have a clear conscience and with that they subconsciously accept the opinions of others. The Göthenburg cars don't stand out so much anymore. Or do they? If we want to be positive, think of the model from 1994. Times change. Now we're going to explain how the importing and reconstruction was done, for the 240/260 and 700 series. 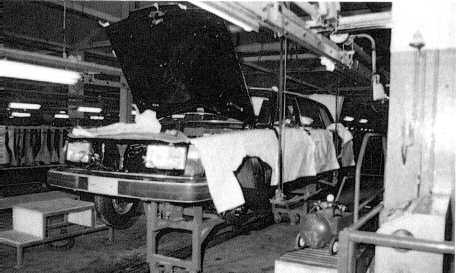 Normally the reconstructed Volvos came from the Bertone plant in Turin, Italy. Everything was top secret, and East Berlin paid well. 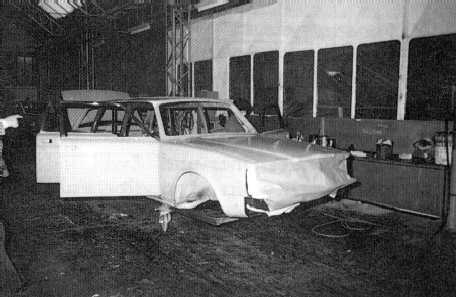 The chassis was delivered by Volvo in Italy (usually 2 doors) together with all the necessary parts and generators. Next came the forming, sanding, polishing and tin plating. Every car was unique. The cars were sprayed dark blue or black and the desired extra's were fitted accordingly. Bertone supplied no extra's. If these were required they were added in the relevant factory for leather, airco or transmitter. 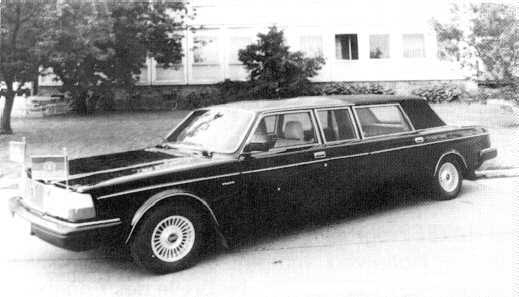 The legendary 264TE limousine was brought out in 1977 and 1978. In the years of 1983/84 there were a few additional 245 "transfers" stretched van's. Altough they were build until 1980. 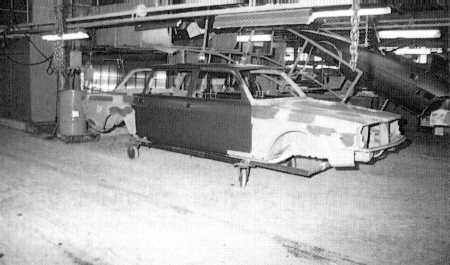 The Volvos that were used in the West generally had false registration numbers and controlshields. That was for an obvious reason. With this they could move more freely in the hurried opposition, especially in West Berlin where they became more aware of the three big powers. As the false papers or numbers became known by German Security Service or by the Internal Security Service an amusing cat and mouse game began. For the official closing of the procession in addition to some 164's, the 245T was also used. 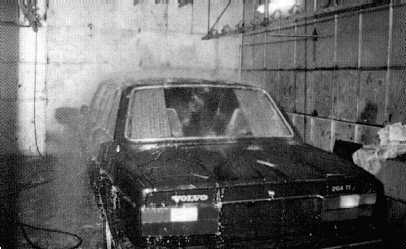 Some of the vehicles belonged to the government and the others were divided amoungst the Stasi. 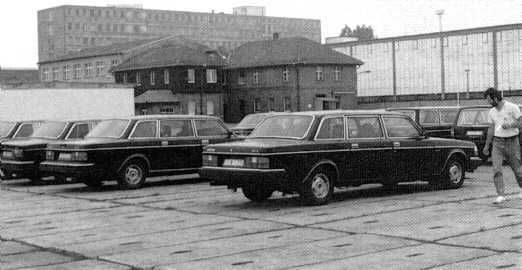 So every "Firm" in the formed East-German had his own carpark full of cars. 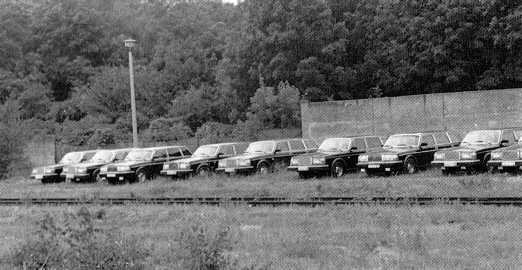 In the 1980's the Volvo car in the carpark were somewhat ............................... Cars from the 760 GL and 740 GL series were added. However, in principle the care remained the same. 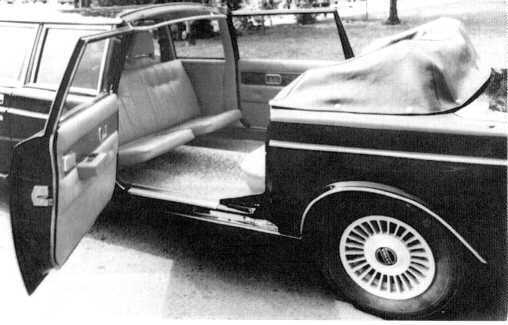 The basis was usually a heavy 264 top of the range model used as landaulet with all the extras, from where the former East Geman bosses stand out, wave and smile to the reserved people. If occasionally cars were "removed" by the bosses of the carparks, they were only used for the internal market. Here the Volvos could be sold for a reasonable price, still much too high for the ordinary citizens. In the first place those were the people who had been of service to the socialistic goals: for example doctors, professors, technicians, scientists and economists. Whether they where happy with it, is another question. 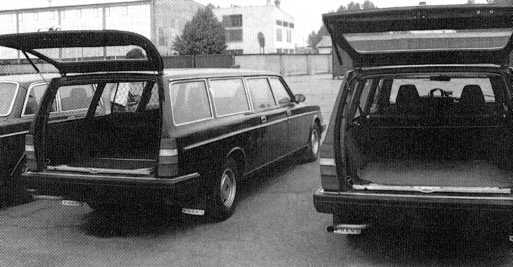 Those low rank Volvos were now third choice, unuseable for the higher positions. By buying you almost signed a contract for half your life. The motto: who oils, drives well. In reality a 264TE has never been sold, mostly it was a cast off 140, 164 and 245. The sweep through the cupboard came in 1990 after "the wall fell". The rest has been resolved and many tried to make money out of it from the political and economical changes. 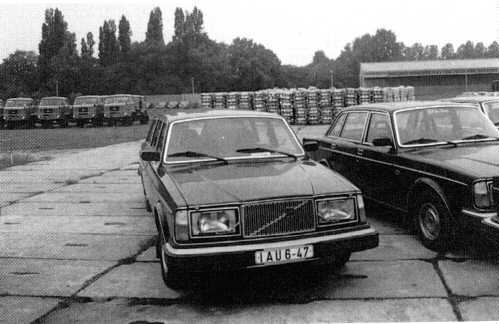 The only chance to obtain a Volvo during the DDR times was given in 1977/78 when about 2,000 Volvo 244 DLSs were imported. The majority of them, as usual, were for well-off citizens, artists who had earned good money. 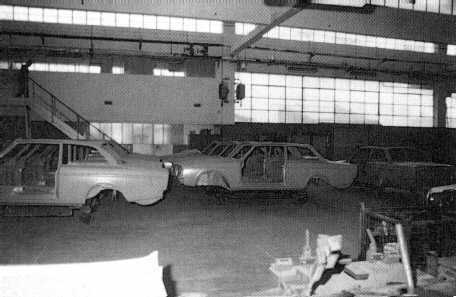 When having saved at least 50,000 East-marks, one had a good chance to be able to become the owner of a 240. A Russian Fiat, a fraudulous copy of the Italian Fiat124, meant pure luxury, costing a mere 19.000 East-Marks. Can one imagine what it meant to buy a Volvo? For a worker it meant something utopian, a dream not to be fulfilled. But, in the end, wasn't it a western car, didn't one have the possibility to get one? An Audi, a Mercedes, BMW? Of course that was totally impossible.